Dr. Johanna Mejia-Fava has spent the past 10 years developing her expertise in marine mammal veterinary medicine. A graduate of Mississippi State University College of Veterinary Medicine, she is completing her doctorate in marine mammal ophthalmology, and is also completing her three-year residency in zoo and aquatic medicine at the University of Georgia and Georgia Aquarium. Dr. Carmen Colitz is a board certified veterinary ophthalmologist with a PhD in molecular biology. Dr. Colitz has extensive research experience involving antioxidants and how they affect eye health, particularly the lens. In addition, Dr. Colitz discovered telemerase activity in cataracts and has had over 10 years research experience working in this field. Dr. Terri McCalla is a board certified veterinary ophthalmologist in Bellinghad, WA. Dr. McCalla's research interest in in retinal pathology, and she has been in private speciality practice for over 20 years. Ocu-GLO Rx is the flagship product in a Family of Nutraceuticals that is designed to support the health of the canine eye. It is comprised of 12 natural antioxidants, including grapeseed extract, lutein and omega-3 fatty acids (GLO). Combined with other key ingredients, such as lycopene, EGCG, CoQ10 and alpha lipoic acid (ALA) this is the first time these antioxidants have been combined into a natural, single-dose nutraceutical of the highest quality. Why Does My Dog Need Vitamins and Antioxidants For His/Her Eyes? Numerous canine breeds are genetically predisposed to eye diseases including retinal degeneration, cataracts, uvetis, gluccma, dry eyes, and others. Diabetic dogs are extremely susceptible to rapidly developing severe cataracts. The most common cause of toxic cataracts in dogs is from retinal degeneration. Approximately 100 breeds have been identified with inherited retinal degenerations. These problems can occur early in life, i.e under two years of age or later, and in young to middle aged dogs. All of these patients may benefit from a supplement especially designed to support the needs of the canine eye. Until now, this supplement did not exist. Ocu-GLO RX is a nutraceutical containing the most innovative, complete, and safe antioxidant ingredients ever formulated for dogs. When Is Ocu-GLO Rx Needed, and What Kind of Eye Diseases Could Ocu-GLO Rx Help? Your dog is generally healthy, but you want him or her to be placed on an excellent lifetime antioxidant supplement to help support and enhance ocular health and also general health. Please keep in mind, however, that the goal of giving Ocu-GLO Rx to your dog is not to cure anything—it is to help lessen ocular damage caused by disease and hopefully “buy some time” in which your dog still has functional vision. It is very important to understand that for many canine eye diseases, medication and/or surgery might be needed in addition to giving your dog Ocu-GLO Rx. 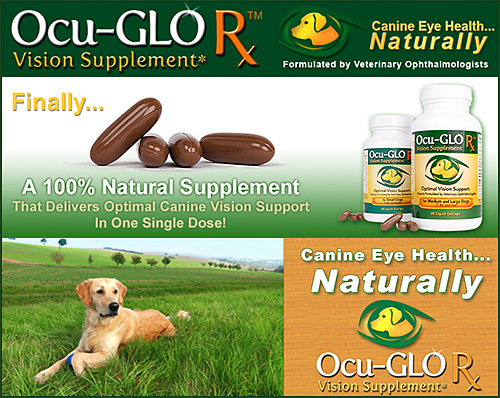 Can Any Dog Be Given Ocu-GLO Rx, Even If They Don't Have Eye Problems? Of course! Ocu-GLO Rx is safe for dogs of all ages and can help prevent chronic diseases as our patients age. Antioxidants beneficial for the eye are also beneficial for other organ systems including the immune system. However, pregnant or lactating dogs should not take the supplement as some of the ingredients have not been tested in pregnant or lactating animals. What Do Customers Say About Ocu-GLO Rx? I have a cockapoo who is 7 years old and noticed he had trouble finding his ball when it would be right beside him. Took him to a specialist and found he has thinning retinas and gradually would go blind. She recommended Ocu-GLO and he has been taking it for about 5 months and though he hasn't improved he doesn't appear to have gotten any worse. He can still see the ball if it rolls a little distance in front of him and today I drilled a little hole into his tennis ball and forced 2 small bells inside to he can hear it as well as see it, he is not a chewer so the hole in the tennis ball has not created a problem and he really goes after it now. We have a dog with PRA. Had we not found Dr. Terri McCalla and Ocu-GLO Rx, our dog, Sheila, would not still be catching a ball in midair to this day! Fantastic product. Order Your Ocu-GLO Rx Today!